Recently elected PJC regents are sworn in for six-year terms Monday evening by PJC Executive Secretary Pam Bennett. Shown from left are Curtis Fendley, Ginna Bowman and Mark Buster. The Paris Junior College Board of Regents swore in recently elected regents and elected officers for the next two years at their November meeting. 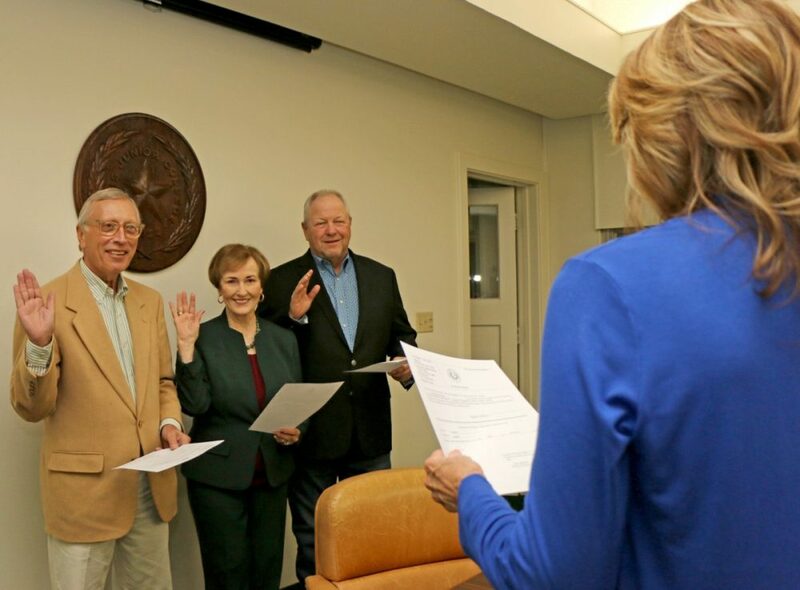 Regents Ginna Bowman, Mark Buster, and Curtis Fendley were sworn in to new six-year terms. TheBoard then held an election for two-year officer terms and re-elected by acclamation Curtis Fendley as President, Dr. Clifton Wilkerson as Vice President, and Berdie Gibson as Secretary. Regents also recognized Math Instructor and Division Chair Mallie Hood and Vice President of Student Access and Success Sheila Reece for their part in PJC receiving the Overall Exemplar Award at the 2018 Math Pathways Awards during the Texas Pathways Institute in Dallas. The award was jointly announced by the Texas Association of Community Colleges (TACC), the Texas Success Center (TSC), andthe Dana Center Mathematics Pathways (DCMP). Hood came in for additional praise from PJC President Dr. Pam Anglin for her work on co-requisites. In the past, students took developmental math courses and later college-level math courses. Studies have shown that taking the two at the same time as co-requisites increases student mastery of math concepts. But scheduling both types of courses at the same time across three locations requires more work. Hood has performed the additional work well, according to Dr. Anglin. •Received a financial report from Controller Keitha Carlton with an update that the 2017-2018 audit is nearing completion and will be presented at the January meeting. •Approved a resolution required by TexPool formally authorizing the college’s participation in their investment pool. •Accepted a new electricity contract with NRG/Reliant from 2022 to 2029 for a delivered price of 3.898 cents per kilowatt hour. Currently PJC pays a little more than four cents and the new contract is expected to save the college about$35,000 per year when it goes into effect. •Received an update on dual credit, showing that from 2014, dual credit students have doubled and now account for 35.22 percent of total enrollment at PJC. • Heard a report from Gibson and Louise Taylor on what they had learned at the recent annual meeting of the Association of Community College Trustees. • Learned as part of the President’s Report of a retirement celebration for Sharon Wood and Beverly Matthews to be held from 2 to 3 p.m. on Friday, Dec. 14 in the Student Center Ballroom. • Accepted the re-assignment of Radiology Technology Instructor Heather Unruh as Radiology Technology Instructor / Program Coordinator effective Nov. 1, and the employment of Jennifer Johnston as Small Business Development Center Director, effective Dec. 3. • Authorized PJC President Dr. Pam Anglin to move forward with a purchase of property.